Super Bowl Sunday is February 3, 2019, and many bars, restaurants and fast food places have discounts on takeout wings, pizza and other traditional favorites. Here’s our roundup of Super Bowl food and drink deals announced by the major chains, in alphabetical order. These can make your Super Bowl party a hit. Auntie Anne’s Pretzels has a Game Day Pretzel Pack for $45 on Super Bowl Sunday. The pack features 2 Pretzel Buckets (any variety) and 10 assorted dips. Available in-store or online from 1/28/19 to 2/3/19. For more details or to start an order, visit Auntie Anne’s Catering. – Four pounds of boneless wings, total price $35. Good at participating locations. Bailey’s announced the special on the Bailey’s Home Page. Bar Louie has food and drink specials starting one hour before the game, and continuing till closing on Super Bowl Sunday. Deals vary by location; many Bar Louie locations plan to serve $5 Signature Burgers. More information on the Bar Louie website. Bertucci’s Restaurants has Game Day Takeout Deals on Super Bowl Sunday including Pizza & Wing combos starting at $29.99. For details or to place an order visit: Bertucci’s Game Day Deals. Black Angus Steakhouse has a $10.99 steakburger and beer special and an all-day happy hour for the Super Bowl. Get a Steakhouse Bacon Cheeseburger and a 16 oz Bud Light draft for $10.99. Also get Bud Light drafts for $3. Good only in the Black Angus Bar; for details see the Black Angus Bar page. Burger & Brew and Happy Hour deals valid for Pro Bowl and SBLIII games on 1/27/19 and 2/3/19 in the BullsEye Bar only. Not valid on delivery. No coupon necessary. Prices and offer subject to change. Bojangles has a 50-piece Chicken Supremes platter for $49.99 on Super Bowl Sunday. Packed with your choice of Chicken Supremes or the mild Homestyle Tenders, the 50-piece platter also comes with 12 sauces. Call your local Bojangles’ today to preorder your platter for Sunday. Also check out Bojangles’ Tailgate Hacks to learn how you can use Bojangles’ menu items as a base for creating your own craveable game day recipes, like BBQ Chicken Mac ‘n Cheese and Buffalo Chicken Crescent Rings. Boston Market has free delivery of takeout and catering orders now through Super Bowl Sunday. Minimum purchase to get free delivery is $7 for takeout or $100 for catering. You’ll need a coupon for the free delivery special; CLICK HERE for your Boston Market coupon. If ordering online use promo code GAMEDELIVERY2019. Brixx Pizza has $8.95 wings on Super Bowl Sunday. Brixx announced the special on Facebook. Buffalo Wild Wings has $5 pitchers of beer on Super Bowl Sunday every weekend through February 17, 2019. Good on select beer brands at participating locations. For more details see the Buffalo Wild Wings Promotions Page. Carrabba’s has 15% off takeout orders with this promo code good today through Sunday, February 3, 2019. Enter promo code SUPER15 and get 15% off a catering, carry-out or delivery order. Minimum purchase of $20 required to get the discount. You can start your order at: Carrabba’s Online Orders. Cici’s Pizza is celebrating the Big Game with a special To-Go offer of 3 medium, 1-topping pizzas for $12. Good only on Super Bowl Sunday. 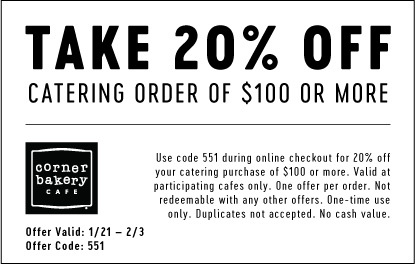 Corner Bakery Cafe has 20% off an online $100 catering order with a coupon good today through Super Bowl Sunday. CLICK HERE for your Corner Bakery coupon. If ordering online use promo code 551. Good for 20% off a catering order of $100 or more. Valid at participating locations only. Good for dine-in or to-go in cafe purchases; not valid with online ordering. Corner Bakery announced the special in This Email. El Pollo Loco has Free Fire-Grilled Chicken Nachos with a family meal purchase on Super Bowl Sunday. You’ll need THIS EL POLLO LOCO COUPON for the deal. Not valid with online or app orders. Fox & Hound Sports Tavern has premium seating with an endless buffet for $25 on Super Bowl Sunday. You must reserve by Saturday, February 2, 2019. The endless buffet includes salad, wings, pasta and salad. Fox & Hound announced the Super Bowl special on the Fox & Hound Home Page. Hickory Tavern has all you can eat wings during the Super Bowl. The AYCE wing special, priced at $19.95, will be available starting an hour before kickoff until the end of the game, the chain said. Also get 10% off a Tailgate Takeout package when you reserve yours before 2/1. For more details see the Hickory Tavern Facebook Page. HoneyBaked Ham has coupons for $7 off a purchase of $50 or more good now through Super Bowl Sunday. CLICK HERE for your HoneyBaked Ham coupon. Hooters has up to $10 off online orders now through Super Bowl Sunday. Get $5 off of $25+ or $10 off orders of $53+. Use promo code 5FREE for the $5 off $25 offer and 10SB for the $10 off $53 offer. The $25+ and $53+ orders must be placed from 1/26/2019-2/3/2019 online at HootersToGo.com only (cannot be placed in store or over the phone) to receive discount at checkout. Hooters announced the special on Facebook. Hot Dog on a Stick has 15% off party packs on Super Bowl Sunday. Enter promo code SUPER15 to get the discount. Hot Dog on a Stick announced the deal on Facebook. Hungry Howie’s has 2-topping large pizzas for $7.99 with an online promo code. Use promo code LG799 to get the Super Bowl special. Good at participating locations and valid on online carryout offers only with code. You can start your order at: Hungry Howie’s Home Page. Insomnia Cookies has 20% off an online order with this promo code good now through Sunday, February 3, 2019. 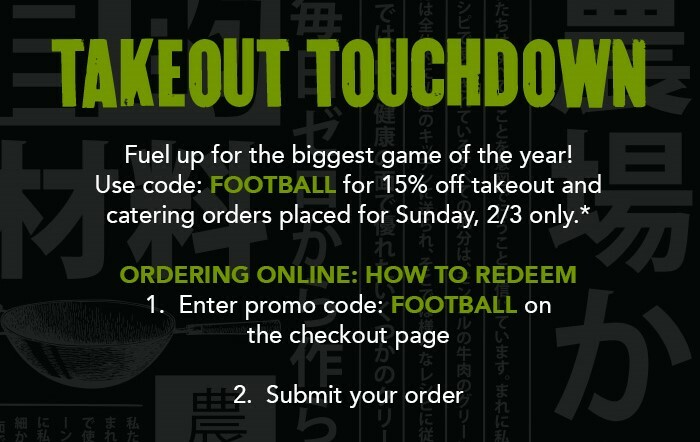 Enter promo code TOUCHDOWN20 to get your 20% off your online order. Minimum purchase of $20 required to get the discount. You can start your order at the Insomnia Cookies website. For more details see the Insomnia Cookies Super Bowl announcement. Legal Seafoods has this Super Bowl special in honor of #12 Tom Brady: Get a half gallon (6 souper bowls) of New England Clam Chowder for $12 from Legal Seafoods takeout counters. Good February 2-3, 2019. Regular price is $23.50. Or get a half-gallon of New England Clam Chowder and 2 lbs. of Shrimp Cocktail for $53 (regularly $83.48). For more details visit the Legal Seafoods Superbowl Page. Macaroni Grill has 25% off your dine-in or takeout order with this Macaroni Grill coupon good today through Sunday, February 3, 2019. CLICK HERE for your Macaroni Grill coupon. Good for 25% off your total check (see coupon for exclusions). If ordering online use promo code TAKE25 at checkout. Good for dine in or carryout. Minimum purchase of $10 required for discount. The deal was announced in this Macaroni Grill Email. Max & Erma’s has 20% off their party platters on Super Bowl Sunday. Max & Erma’s announced the deal on Facebook. O’Charley’s has these chicken and ribs takeout specials on Super Bowl Sunday: Family Chicken Tenders Dinner: Get 20 chicken tenders, 8 sides, and 3 dipping sauces for $25; Ribs Picnic Pack for $40: comes with 4 portions or ribs, 4 sides and one whole pie. Deals are good for takeout only at participating locations. You can start your phone or online order at: https://www.ocharleys.com/locations For more details see the O’Charleys Super Bowl special announcement. On the Border has 15% off an online takeout order of at least $200. From February 1-3, 2019, get 15% off with promo code FIESTA15. On the Border announced the deal on Facebook. Orange Leaf Frozen Yogurt has half off a catering order with this coupon good today through Sunday, February 3, 2019 (Super Bowl Sunday). CLICK HERE for your Orange Leaf coupon. Good for half off a catering order purchased in-store. Orange Leaf announced the half off special on Facebook. Panda Express has $10 off a Family Feast with this Panda Express promo code good today through Super Bowl Sunday. Go to https://orders.pandaexpress.com/ or the Panda Express app, and choose Family Feast under the Build Your Own category to get your order started. Use the promo code ‘TOUCHDOWN’ at checkout to redeem offer. Good for $10 off one Family Feast or good for $25 off two Family Feasts. The Family Feast includes two large sides and three large entrees. Papa Gino’s Pizza has half off with this promo code good now through Super Bowl Sunday. Enter promo 6980 and get half off an online takeout order. For more details or to place your order, see: Papa Gino’s Super Bowl Specials. Papa Gino’s also has other pizza specials on their deals page. At Papa John’s Pizza place an online order for $20 or more now through Super Bowl Sunday and get rewards points for a free pizza. For more details or to place your order, see: Papa John’s Free Pizza. Papa John’s also has other pizza specials; for a roundup see our article, Papa John’s $6 Pizzas. Pilot Flying J travel centers have a free slice of pizza for app users on February 3-10, 2019. Download or open the myPilot mobile app within these dates to find the offer waiting to be redeemed at the more than 300 Pilot and Flying J Travel Centers serving PJ Fresh Pizza. First-time users receive an additional free drink of their choice when downloading the app. Red Lobster has 10% off an online takeout order February 1-3, 2019. “Kick off the big game with 10% Off all online To Go orders from February 1-3 using code LOBSTER65,” Red Lobster said in their deal announcement. “From seafood, pasta and chicken platters to party-sized soups and salads, we’ve got the playing field covered.” Red Lobster announced the deal on Facebook. Round Table Pizza has 20% off all orders and other deals good now through February 4, 2019. Enter promo code GAME20 to get 20% off your oline order. Also get a pizza and wing special for $19.99. You can find both deals on the Round Table Home Page. Spaghetti Warehouse has a “Super Meatballs” special for the super Bowl. Get 24 made-from-scratch meatballs for $20, good today through Sunday, February 3, 2019. A 24 hour notice is required. Choose one sauce from Classic, Spicy Sriracha Tomato or Honey BBQ. Get additional sauces for $5 each. Just call your favorite Warehouse to order. Offer is not available in Columbus OH or Syracuse NY. Spaghetti Warehouse announced the meatball special on Facebook. Also get 20% off an online takeout order good now through March 4, 2019. Click here for more details from Spaghetti Warehouse. Taco Bell has a 12-pack of tacos for $12.99 starting February 1, 2019. Good at participating locations. For more details or to start your order visit: Taco Bell Party Pack. Texas de Brazil has 20% off your dine-in check or takeout order on Super Bowl Sunday. Show your server This Texas de Brazil web page to get the discount. Good for dine-in or takeout. TGI Fridays has 15% off a Party Platter with this promo code good today through Super Bowl Sunday. Use promo PLATTER15” at checkout to get the discount. TGI Fridays announced the Platters Promotion on the TGI Fridays Promotions Page. Tijuana Flats is giving out a free Burro Bash with a catering order for 20 or more people on Super Bowl Sunday. Ask for “the Big Game Special ” to get the offer or show your server the Tijuana Flats Catering Page. White Castle has 20 Original Sliders for $10. Good for online and app orders only. For more details or to place your order see the White Castle Promotions website. Whole Foods has ready-to-serve chicken wings for $4.99 a pound at many locations in a Super Bowl special good today through Tuesday, February 5, 2019. Choose from multiple flavors. Check your Local Whole Foods Sales Flyer to see if they have the deal. Wienerschnitzel has 25 mini corn dogs for just $5 on Super Bowl Sunday. Limit 4 per customer. The hot dog chain announced the special on the Wienerschnitzel Home Page. First Down- 50 Wings (25 Boneless & 25 Original) 3 Ranch, Jumbo Order of Kettle Chips or Wedge fries for $49. Use Offer Code #2113. Touchdown-100 Wings (50 Boneless & 50 Original) 4 Flavors, 4 Ranch, & 2 Jumbo Orders of Kettle Chips or Wedge Fries for $95. Use Offer Code #2115. For more details see the Wing Zone Facebook Page.